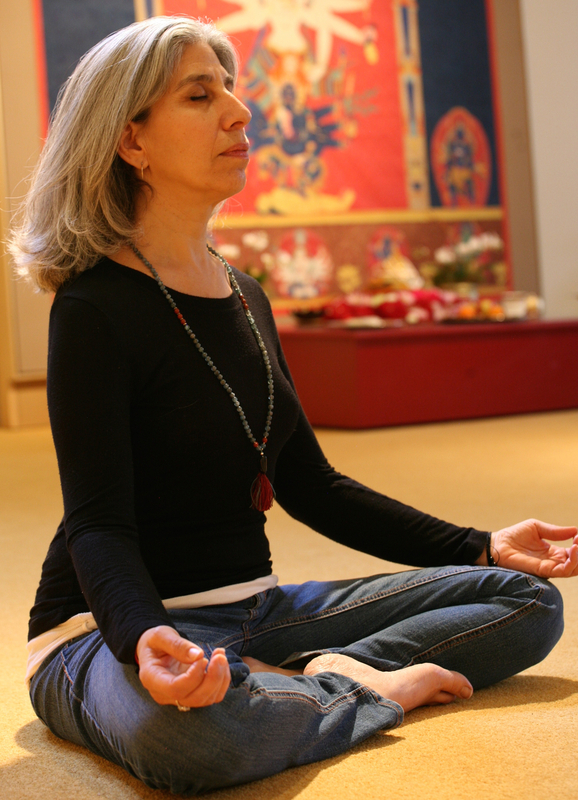 Join our outstanding meditation classes in Portland at The Movement Center. We offer a number of courses on the theory and practices of Kundalini meditation, as well as short guided eyes-open meditation classes for beginners and every level of experience & interest. Visit our site today for more details. If you are a beginner who is curious about meditation or an experienced meditator who just wants to try out our practice, you are welcome to come to one of our Monday or Wednesday night meditation classes in Portland. They start at 7:00 pm and last for an hour. Monday and Wednesday evening meditations at our Portland center include chanting, a short dharma talk, and a guided meditation focusing on some aspect of our practice, such breath, mantra, chakras and channels, working with creative energy, releasing tension, or growing spiritually. Our $5 Yoga Class, taught for all levels on Monday and Wednesday from 5:45 to 6:50 pm is a great preparation for sitting in meditation. For a preview of our practice, here is a guided meditation video from Swami Chetanananda, our founder and spiritual director. Here's a discussion of why we practice meditation. Want to learn more? We offer a number of courses on the theory and practice of kundalini meditation through our Learning Center. Do you need support for practicing at home? Try a guided meditation CD by Swami Chetanananda, available from the Rudra Press store. Do you have more questions? Check our meditation FAQs below or contact us. “Meditation is about changing patterns within yourself by bringing your mind to a still point over and over again. Each time, you concentrate within yourself; each time, you connect deeply within yourself. Your whole field of attention contracts to a dynamic still point, within which is released whatever pattern of restriction is functioning at that moment. What replaces it is a broader, finer pattern. Our core practice at the Movement Center is eyes-open meditation, a dynamic practice with transformative effects. In eyes-open meditation, students sit as a group in silence with a teacher who represents the accumulated wisdom of the lineage as well as a limitless source of creative energy. Eyes-open meditation is an opportunity for us to awaken our own creative energy. Our connection with the teacher is the bridge from our ordinary existence to the amazing possibility that exists for us. We can participate in the experience of the state of joy and fullness that is the foundation of our existence. In that experience, we are in contact with all of our senses, our personal reality, and from that place, we learn to make contact with the ultimate reality. We’re trained in how to maintain our center as we move throughout our day. We learn to fully occupy the space of our physical bodies and the space of our lives. We become aware of the subtle dynamics at work in our environment. Eyes-open meditation practice is held in Portland on Tuesdays, Thursdays and Saturdays at 7:00 pm. Before attending eyes-open practice, please attend the Monday evening public meditation program where you will you receive instruction in our meditation and eyes-open practice. All of our meditation programs are contribution-based. Please make a donation according to your means. No one is turned away for lack of funds. Swami Chetanananda: Prepare a special place for your meditation practice, a clean and uncluttered space that reflects your respect for the practice and your effort. If you can, try to set this place aside for meditation only, making it special with fresh flowers, incense, and some of your favorite beautiful things. When is the best time for meditation? Swami Chetanananda: Find the time that works best for you. Many people like to start their day with a period of meditation; another popular time is early evening – after your work day and before the evening. Whatever time you choose to sit, the most important thing is to develop a pattern, making the effort to sit every day at the same time and in the same place. In this way, you develop an appetite for it, and the pattern itself will support you in your desire to practice regularly. How long should meditation last? Swami Chetanananda: About 45 minutes is ideal, but on some days you may not have 45 minutes. On these days, instead of saying, “Oh, I don’t have time, I guess I won’t meditate today,” just sit for as long as you can. Make it your commitment to sit for at least 15 minutes very day – no matter what. This simple discipline will support your practice enormously. Swami Chetanananda: You should sit at least once every day. If your schedule allows and you find you have the interest, many people like to sit both in the morning and in the evening. Again, the most important factor as you begin is to develop a simple pattern that you can easily incorporate into your day. The pattern itself will support you as you go on. Is there a “right” or “wrong” type of meditation experience? Swami Chetanananda: Miracles are possible every time you sit. You will have every kind of experience in your inner practice, from completely constricted to totally open and flowing, Remain centered and focused through every kind of experience, allowing it to become part of the flow of energy. You will develop the ability to absorb everything deeply within yourself, turning every experience into fuel for your growth. What are the most important elements of a spiritual practice? Swami Chetanananda: To develop a deep spiritual practice, one needs instruction in some techniques of meditation, an introduction to the philosophical underpinnings of those techniques, the guidance of an acknowledged teacher, and a guided meditation to follow as often as you like. All you need to add is your desire for growth and your simple, determined effort, every day. Make a commitment to your own growth. All it takes is a quiet place, a few minutes of uninterrupted time, and a commitment to do it. Remember, the only way to understand meditation is to experience it. Why is meditation an important part of the practice at The Movement Center? Swami Chetanananda: Unlike systems that rely primarily on either scriptural authority or strict logic and reason, Kashmir Shaivism emphasizes the direct, personal experience of its practitioners – from the ancient scholars of India to you and me. You are encouraged to explore the teachings and test and retest them every day in your own practice. This simple approach is profoundly different from filling up your head with ideas. The goal is to experience, firsthand, the infinite nature of the inner Self. Learning about meditation is part of the on-going dynamic discovery of your own true nature. It is your discovery. The grace of the teacher and the techniques of the practice will lead you to the door of that discovery and even suggest to you how to open it – but only you can actually do it, and only you can walk through. The choice is yours to make, at your own pace and of your own free will. Why should we take up a spiritual practice? Swami Chetanananda: In my experience of the last forty years of being involved in the world as well as building a spiritual community and teaching, the only thing that I have ever experienced that brings a permanent sense of meaning, richness, and depth to people’s lives is a spiritual practice: continuously, daily reaching within ourselves, looking inside, opening ourselves up, finding our creative center and cultivating the unfoldment of that. It is a real endeavor – it is not a joke, it is work. But it is a work that allows whatever else we do with our lives – whatever other way we spend our days – to become permeated with enthusiasm, with joy, with vitality, with excitement, with a continuous, unbroken sense of upliftment, even when it is very difficult. So, I’m not particularly concerned with where you pursue this endeavor or in what form you pursue it, but I really encourage you to pursue the unfoldment of your own inner Self in whatever way you personally find comfortable. And in this endeavor, sincerely, I wish you well.